Is a system for achieving plantation sawlogs in the shortest time possible. Like Agroforestry, it uses wide spacings between trees so that each has more resources and can grow faster to sawlog size. *genetic selection of varieties better suited to growing sawlogs in the first place. 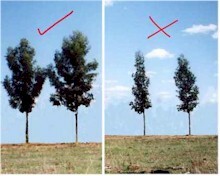 Fat Eucalypts seeks to avoid competition between trees so that they end up growing shorter and fatter with dense full crowns - rather than the tall, thin, skinny stands which have come to characterise plantation eucalypt culture  in the belief that such trees will produce a more stable young fast-grown sawlog. It is not however simply a matter of spacing. Appropriate genetics are also essential because most historically selected strains of eucalypts will grow a tall skinny tree even when given all the space in the world. Such thin crowned trees will not only fail to make optimal use of sunshine and growing space but they have clearly failed, despite producing a massive amount of fuelwood and pulpwood globally, to produce easily milled plantation sawlogs. Fat Eucalypts follows work done last century in New Zealand, particularly by the farm forester Neil Barr. It has drawn its inspiration for selection of genetic characters from the example of Bartletts Saligna a New Zealand landrace of Sydney Blue Gum which has a history, unusual in eucalypts, for milling well from young fast grown trees. These particular genetic criteria were invoked when selecting the final crop trees in Small Tree Farm seed orchards to produce strong outcrossed seedlines rich in the characters represented in the Bartletts logs which milled so well. 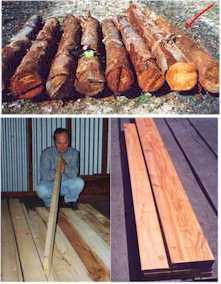 The promise in Fat Eucalypts is in providing the option of fast grown eucalypt sawlogs which could be sawn and dried by simple and cheap low-tech means. Potential outcomes include better log prices and value adding opportunities for growers, and opportunities for obtaining sawn product from young eucalypt in regions where capital intensive means are not affordable or appropriate. Improved Seed Orchard Seed, now available from Small Tree Farm, is designed to produce vigorous outcrossed stands with rich selection opportunities for discerning growers. See Seed Supply. The old agricultural saying that success involves 50% breeding and 50% feeding is especially true of tree farming where growing stock may be carried for decades. It makes sense to use the best seed that is available at the present day. The inspiration for Fat Eucalypts came from these long, wide, straight, air dried boards of 25 year old Bartlett’s strain of Sydney Blue gum. 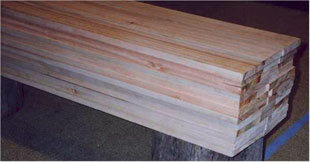 These were milled on farm with a most basic sawmill at Neil Barr’s farm in New Zealand. While strains of eucalypt that grow tall and skinny - even when free of competition - are very efficient for producing bulk fuel and pulpwood with minimum silvicultural input, they are rarely adaptable to producing short rotation sawlogs. This deficiency is evident on a grand scale in plantations thoughout the world. The genetic selection program at Small Tree Farm looks to produce a tree better suited to sawing. 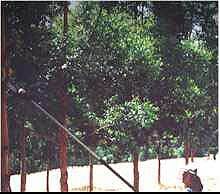 Young eucalypt logs from tall skinny trees tend to bend, warp, and split badly because of internal tensions. Milling is only possible through expensive technical fixes such as cutting into very small pieces, kiln drying, planing square, gluing together again, and encasing in resin to stall further movement. Better to grow a log suited to milling in the first place. These small 4½ year old logs thinned from the genetic selection program in the Sydney Blue Gum(E. saligna) seed orchard at Small Tree Farm retained their stability well. 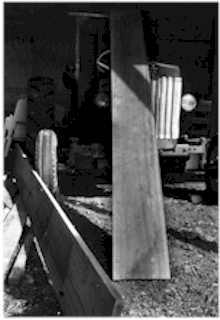 They milled successfully on a basic sawmill producing the air dried, dressed boards seen here. There is no such thing as a free lunch. As with any agroforestry regime, there is expense of pruning the widely spaced trees. Such work will be a better investment if done on superior genetic stock.